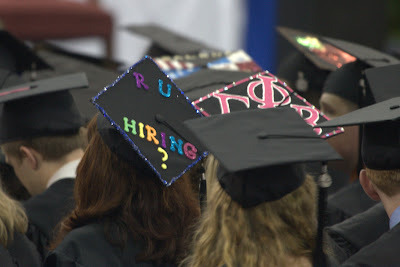 Personalizing your graduation cap is a tradition for many college graduates. At CNU's graduation today, there were many clever messages but this one captured what's on the minds of many graduates in this tough economy. I bet she's a marketing major. Canon 40D, 1/15 sec at f/5.6, ISO 1600, 400mm focal length. Hand held with the help of image stabilization. nice. ha ha. I like this idea. good work! That's classic, funny, and smart!